2009 November 3, Moscow, Zelenograd, Spassky Stanislav. In previous articles the author analyzed the possibility to present the particles with nonzero rest-mass by localized wave objects similar to "standing wave" type, which are composed of multidirectional harmonics of approximately one frequency, objects, which are capable to move (to travel). 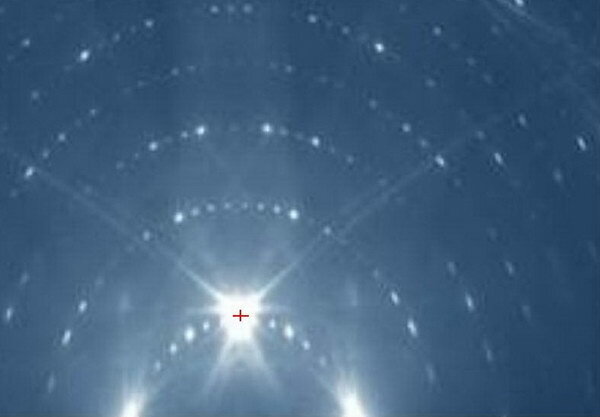 This is a certain form of modified "running wave", closed on itself, that is modified photon. That is why in such objects some frequency prevails, which corresponds to Planck’s low and which is implied in the Schrodinger equation. If we accept this assumption, we can understand many phenomena of physics, yet are incomprehensible. The experiment is proposed, proving (or disproving) this. Using proposed model, for example, it is easy to understand, all main aspects of special relativity. And such aspects, as the meaning of Lorentz transformations and the invariance of the speed of light. Lorentz systems are distinctive because the wave operator with parameter C has invariant form in them. It has exactly same form, as in systems resting on the wave medium. Therefore, all wave objects (and also all of physics) have the same forms (and look and formalized) as in systems resting on the wave medium. Including the wave speed (light speed) C. And all these systems are formally equivalent. Although only some of them really rest on the wave medium. It is easy to understand the relationship of mass and energy, since mass is the inertial coefficient for the object of this type, the set of harmonics of "standing wave" type. And the object itself actually is represented by the wave energy. In such object at rest all the wave (energy) flows are compensated vectorially. In moving object wave components are not balanced, there is resultant flow of energy (that is momentum). Every harmonic gains vector additive in a certain direction, the picture of flows is modified. But in some Lorentz system this object looks like at rest relative to wave medium. Thus, Planck's law for the photon prove "working" (in terms of frequency) also for particles with rest mass. Wavelength close to the classical and corresponding to this frequency at wave speed C is called the "Compton wavelength" and appears in many physics formulas. Particularly, it is associated with gravitational radius of the particle. It is in the photons at annihilation of an electron and a positron. Made assumption about particles with rest mass as a "closed on itself" form of photon and validity for them Planck's Law gives reason to suppose that the internal binding energy in these particles constitutes a small part of its total energy. This means that a strong distortion of the wave properties of the wave environment can be localized in relatively small area with size of about Compton wavelength. Hence, the presence in objects the Planck frequency (proven) should provide the presence of waves with the Compton wavelength in them. It is easy to understand the gravity as the phenomenon and connection the gravitational and inertial mass, if we assume that the local concentration of particles (wave energy) result in a change of the wave medium properties (decrease of C with the increase of gravity). Gravity curves the trajectory of a photon as a "running wave", and hence the trajectory of each plane harmonic component of the particle. So that part of the particle, which is located in a region of more strong gravity takes the form of particles (on the picture of plane harmonics) that corresponding to the particle with lower potential energy, but without a change in energy. The increase in particle kinetic energy is simply "convenient" to describe the gravity by potential field. Gravitational radius is deduced simply on made assumptions. And gravity should not relate to the curvature of spacetime in regions of gravity. It changes metric of "wave space" due to changes in the wave properties of the medium. Therefore, it changes the sizes of the particles as a wave objects as well as the frequencies in these objects (i.e. "their space and time"). De Broglie wave in this variant is obtained as the resultant of two opposing almost classical waves of similar amplitude and with corresponding small difference in frequency. The wave pattern of two such waves throughout coincides with a wave of de Broglie, if we exclude from consideration the primary wave structure. The total energy of flow is the total energy of two waves, and the difference between opposing flows due to some difference in frequency gives the total net flow of energy (momentum in fact). The Schrodinger equation can be regarded as an equation, which excludes from consideration the primary, "internal" wave structure, but only considers the move of the wave energy by associating it with "modulating wave". Can be proposed an experiment that confirms the fact that particles with nonzero rest mass have an internal wave structure with Planck frequency νP = E0/h and the wavelength corresponding to the Compton wave λC = c/νP = h/(mc) ? In a previous article, the possibility to find the corresponding wave structure considered in the experiments on diffraction of electrons passing through a thin layer of the crystal. The appropriate wavelength for an electron (Compton’s wave) is about 1/40A. 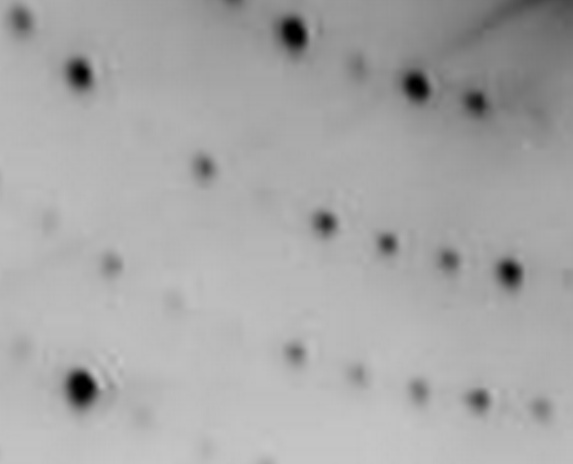 Now the author more inclined to Reflection Electron Diffraction experiment (RLEED or RHEED). But special restrictions on the size of the sample surface must be in the experiment. Consider briefly the essence of the proposed experiment. Traditionally, in these experiments behavior of reflected electrons is described by de Broglie wave. As already mentioned, it was assumed that the de Broglie wave really consists of a pair of opposite quasiclassical waves. And the performance of condition for a possible "allowed" directions of the reflected electron is the simultaneous performances of conditions for two close in frequency (and wavelength) forward and backward waves. Periodical (on corner) the coincidence of conditions for direct and reverse waves is interference picture of de Broglie waves. Let d is the step in the crystal lattice (we suppose about 1A). Let λdB is de Broglie wavelength of an electron. We take λdB of the same order as d, 1A. It is not essential, but the picture of a lobe of the main peak will be larger. 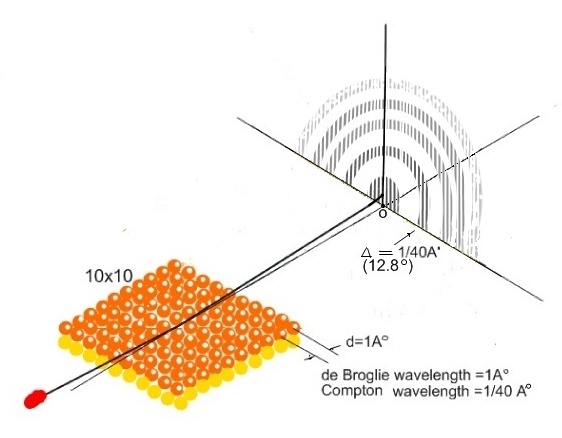 Compton wavelength (i.e. the supposed wave) for the electron is about 1/40A (further λC), practically does not depends on the electron kinetic energy in our experiment. Under these conditions, the resultant directional diagram of the lattice for reflected electron is the product of two directional diagrams: the diagram of the one lattice column (along the beam) and the diagram of the one row (transversal to beam). Maxima of 1st diagram lie on a series of concentric circles with center at O, and must satisfy the condition for change of (1-Cos(a)) by 1/40. Maxima of 2nd diagram satisfy the condition Sin(b)=m*(1/40) and are presented by a series of vertical lines at regular intervals. We are interested more by manifestation of the 1st diagram, as more visible, it will be discussing. But in fact, the 2nd diagram can manifest itself somewhere "brighter" in the form of vertical dashes. Let us consider the behavior of the "conditions" for forward and backward waves in reflected beam if we move away from the main peak of reflected beam. The position of this maximum is about 1-3 degrees to the plane of the crystal. Under our assumption at this direction we have the performance of required conditions for the forward and backward waves in the reflected beam. Firstly with angular going away from this position the difference of the allowed directions for forward and backward waves are insignificant because of the small difference of their wavelengths (dλC). From the condition λdB = λC * (λC/dλC) we have dλC = λC ^2/λdB (in our case it is 1/1600A). As we will show in our case the width of directional lobe for the forward and backward waves is order of λC/(2*10), i.e. 1/800. Therefore, there is zone of performance of conditions for two waves in the 2nd maximum. This 2nd maximum located at angular distance of about a=12.8 degrees from the main maximum for accepted parameters d*(1-Cos(a))=1/40. Now, about the width of mentioned directional lobe λC/20. It is proposed to take a sample of the crystal surface of about 10 rows and 10 columns. Why this restriction is introduced? First, the lattice with a large surface have irregularities as in structure and in inclination of surface which is not flat, but varies quite a lot. This certainly leads to strong dependence for all considered directions on place of the lattice, where the electron falls. 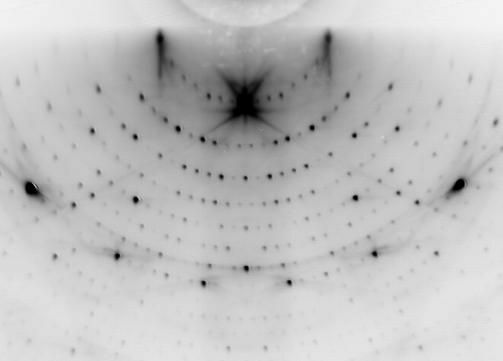 The picture is eroded, and the primary structure of the diffraction disappears. Second, we need to provide enough width of the lobes as it was mentioned above. In lattice the main lobe width is determined by the condition of the phase difference of π on the overall size of the lattice. In terms of the lattice steps it gives the difference in the beam path (λ/2)/10=λ/20. The 2nd maximum of the Compton-wave corresponds to the difference in path 1/40A per d. And the width of main lobe de Broglie wave (the radius) corresponds to λdB/20 = 1/20A. So the 2nd maximum as well as 3rd and 4th (if they appear in form of circles) fall into a zone of main lobe of de Broglie wave. Therefore, these maxima should be found on the background of the main lobe of de Broglie-wave. A few days after displaying this article on site the author found in the Internet an interesting example of RHEED with high resolution on NANOCOMIC webpage (rheed.jpg) . Here is presented the scaled-up fragment of this picture. It is clearly visible wave structures around almost all "peaks". Of course, there may be different interpretations of these phenomena. Perhaps this is a manifestation of some properties of the fluorescent screen. Secondly, it may be "secondary" lobes in the directional diagram, if we assume a very small sample size (about ten Angstroms) or similar spatial restrictions of wave objects themselves (electrons). But we can also assume that these are traces that we are looking for, namely, the primary wave structure with the Compton wavelength. Near all peaks of the circle above the main peak (marked by "+") there are vertical dashes, that are repeated twice more often than the vertical structure of the de Broglie waves are repeated. This means that in this concrete case the wavelength of direct wave, constituting the de Broglie waves is half of the de Broglie wavelength. Proof of existence of the internal wave structures in the particles would be difficult to overestimate for a rethinking of physics. Here is another example of RHEED. Unfortunately, the source is lost. Sample itself and its two scaled-up fragments are given below.